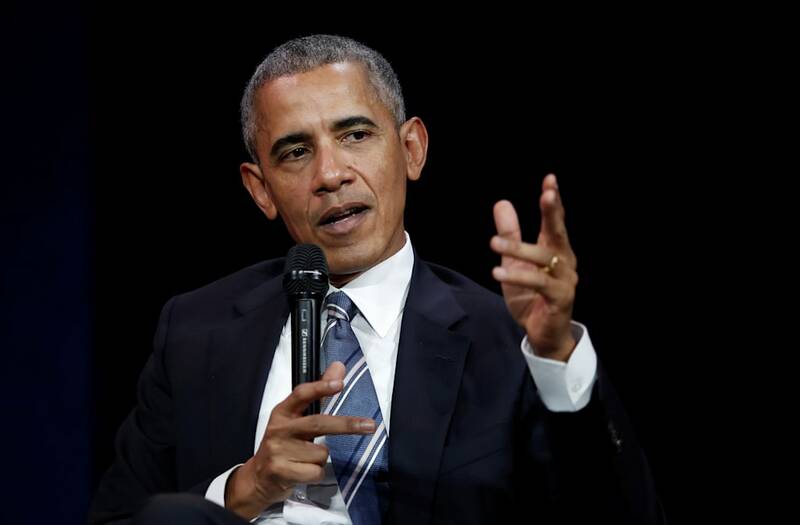 WASHINGTON — Former President Barack Obama says the same innovations in technology that helped make his historic election possible have now evolved to exacerbate the nation’s political divides, keeping many Americans inside partisan "bubbles" of their own making. In a rare extended interview, Obama tells David Letterman that social media and the increasing personalization of many Americans’ information streams has led to the reinforcing of biases. "One of the biggest challenges we have to our democracy is the degree to which we don’t share a common baseline of facts," the 44th president told Letterman for his new Netflix series, "My Next Guest Needs No Introduction." "What the Russians exploited but it was already here is we are operating in completely different information universes. If you watch Fox News, you are living on a different planet than you are if you listen to NPR," Obama continued. "That’s what’s happening with these Facebook pages where more and more people are getting their news from. At a certain point you just live in a bubble," he said. "And that’s part of why our politics is so polarized right now. I think it is a solvable problem but it’s one we have to spend a lot of time thinking about." Obama said that his success in 2008 was made possible in part because of how his campaign used social media as an organizing and messaging tool just as the technology was emerging. "We essentially built what ended up being the most effective political campaign in modern history. So I had a pretty optimistic feeling about it," he said. "I think that what we missed was the degree to which people who are in power, special interests, foreign governments, etcetera, can in fact manipulate that and propagandize." The comments were the closest Obama came to addressing American politics during a nearly hour-long sitdown with Letterman, which occurred in the fall of 2017. Though Letterman made several allusions toward President Donald Trump, neither he nor Obama ever mentioned him by name as they discussed everything from Obama’s routines since leaving the White House and goals for his post-presidency to his family life, with candid reflections on his unusual upbringing and the emotion of seeing the first of his own daughters off to college. Reflecting on his own presidency, Obama said that in retrospect he wished he hadn’t been so quick to let the constraints of the office change how he interacted with the public — an observation that might suggest he had a degree of envy that Trump has not followed suit. "When you become president and you’re in the Oval Office you feel, ‘OK, now I have to act presidential.’ And we lost track of what had gotten us there, and that was our ability to tell stories and relate to people," Obama said. "In fairness part of it was, the world economy was collapsing and I had two wars that I had to deal with. So that’ll make you kind of serious." Obama said his wife’s ability to maintain, if not grow her popularity, was in large part because of how she adapted to her role as First Lady. "One of the things that Michelle figured out in some ways faster than I did was, part of your ability to lead the country doesn’t have to do with legislation, it doesn’t have to do with regulations, it has to do with shaping attitudes, shaping culture, increasing awareness," he said. "She’s doing all this cool stuff I’m standing behind a podium and I’m droning on and on about, ‘Well, the legislative strategy for such and such.’ And people are clicking the television trying to find something else." Obama was Letterman’s first guest for his limited run Netflix series, which debuts Friday. The show opened with Obama as president sitting with Letterman on his long-running CBS show, musing about how he might want to reconnect with Letterman once he left office to play dominoes or go to Starbucks. Obama teased Letterman now about his "biblical" beard and idiosyncrasies. Obama said he didn’t miss the trappings of the office. "I think there was a sense I’d run the race, I’d completed it, I was proud of the work that we had done, and that I was ready for the next stage," he said. "The stereotype of former presidents is you’re sitting around your house waiting for someone to call, lonely." "No, that’s me," Letterman quipped. "But the truth is it felt exciting," Obama added. In the episode Letterman also traveled to Selma, Alabama to walk across the Edmund Pettus Bridge with civil rights icon and Georgia Rep. John Lewis. Lewis reflected on how the "Bloody Sunday" march he led helped pave the way for Obama’s eventual election, but he called Trump’s presidency "a major setback to the hopes, the dreams and aspirations of a people." "What is happening in America today is a threat not just to our own country but to the planet," Lewis said. Obama pivoted the conversation on race to discuss barriers that still exist for voting in America. "We’re the only advanced democracy that deliberately discourages people from voting," he said. "What ends up happening is we have some of the lowest voting rates of any democracy on earth. The truth is that people opt out themselves because they just don’t think anything can happen." When it came to his current family life, Obama described the sadness of sending daughter Malia off to college, "sobbing" and "misting" for weeks leading up to it and being of no use as the rest of the family helped her move in to her dorm. "I was basically useless," he said. But technology allows him to stay in regular contact. "She knows I’m pathetic so she [texts] me … We’re talking on a regular basis."